Dad had carpal tunnel surgery yesterday. Paula went with him, then took him home and Aimie stayed the day with him. I went over after work and stayed until 10 pm…he’d been in bed since 8:30 so I figured I was safe to go. Still felt weirdly guilty leaving him alone. Dad sometimes states that he feels like a burden. That makes me sad. He’s not a burden, and there are enough of us to share the load even if he sometimes requires help. Isn’t that what family is for? And besides, he would, AND HAS done the same for all of us. I guess I WAS always the one to go to the hospital. But I’m learning to share the load. It’s better when we work as a team. Still some members of Team Gregory that I would trade though…. Ohhhhh but that’s another post. And I’m trying not to complain, remember? Had brunch with a dear friend today. A faith filled woman of God. She gave me Good advice: take care of myself and don’t give up on God. Simple but true. Sometimes I get caught up in trying to fix everything and help everyone else that I forget to take care of me. And though I’ll be more involved with helping Bob get through this next leg of the journey, I’ll take care of me too. It seems that anyone and everyone can share their problems with you, but not many share encouragement. Why? God help me to be an encourager, not a whiner. Life does have GOOD in it, we just need to look for it. Help me to see the good, and to share the good. I need to focus on good stuff, so I can help others to do the same. But I have prayed for thee, that thy faith fail not:and when thou art converted, strengthen thy brethren. The psychologist that sees Bob, tells me that I should get ACT counseling. She says spouses of chronically ill patients do well with this therapy. I’m sure they do, but I’m not a spouse of a chronically ill patient….am I? And I don’t accept what’s in the moment, do I have to? I’d rather just get my faith back up to a place where I can believe for Bob to be renewed and made whole again. I don’t accept where he is. I don’t want him to accept it either. I want to ACT on my faith. spent yesterday in the clinic and hospital. 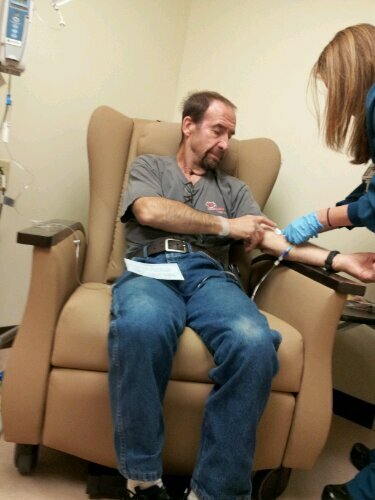 Bob dehydrated again, needed IV fluids and went for swallowing test. doc called this morning to say he has an esophageal stricture. will be setting up a scope and more testing to try and fix. will also be seeing an ENT doc. I pray we get to the end of these complications soon. Bob is so frustrated, and sick of being sick. I concur. must admit that I’m not a good as I used to be at this. worn down. Bob has been approved for disability. Something in me wanted him to NOT be approved. As if the Social Security Administration’s determination would actually declare him NOT DISABLED, and therefore he’d just have to be …NOT disabled. Unfortunately, Bob’s cognitive testing has shown a deficit worthy of a neuro-psychologist’s intervention, and worthy of the designation of temporarily disabled. He’ll start neuro rehab, work with the neurology team and get to an optimal state of cognitive ability. Hopefully that state of cognitive ability will be one in which he can feel like himself again, and not feel — well…disabled. He was temporarily disabled 10 years ago, received disability benefits, then recovered enough to discontinue the disability. So, I want that outcome again. Funny…some people actually want to be disabled. I hate this.